Below is the most up to date information regarding the surveys we have submitted to the marketplace. This page will be continued to be updated, and the results below are not meant to be taken as exact facts of the marketplace until the survey process has been completed. The results below are merely real-time results of what we're seeing. 1. Comfort Satisfaction - How satisfied are you with the comfort and durability of your RV's furniture and mattresses. In our initial findings, 78% of end users find the comfort level in their RVs to be either unsatisfactory, or very unsatisfactory. More concerning, there have been zero entries claiming to be satisfied at any level. 2. Replacement Sought - Have you replaced the furniture cushions or mattresses in your unit? Only 33% of the subjects claimed to have sought a replacement. This isn't a terribly high number, except for the fact that the lack of replacement mixed with the results of satisfaction point to a high number of RV owners currently experiencing dissatisfaction in comfort. Furthermore, we had zero entries claiming to have sought the replacement through a warranty process. This means that the chances are likely that are is a dissatisfaction in the field that is not being considered by manufacturers. 3. Time Period of Replacement - How soon after your purchase did you seek replacement? You'll notice the same statistic as #2, that 33% of the surveys submitted included those who have replaced their cushions or mattresses. However, what this chart illustrates is that the same number has sought that replacement within the first year of ownership. In other words,100% of the replacements we see have been within one year of use. This points not only to an issue with comfort, but also an issue with durability. 4. RV Type - What do you currently own? 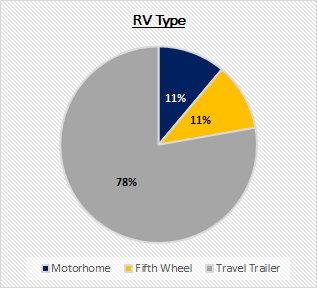 For qualifications sake, the above chart reveals what sort of RV's we're talking about. As shown above, the majority of those who have participated in our survey are Travel Trailer owners.